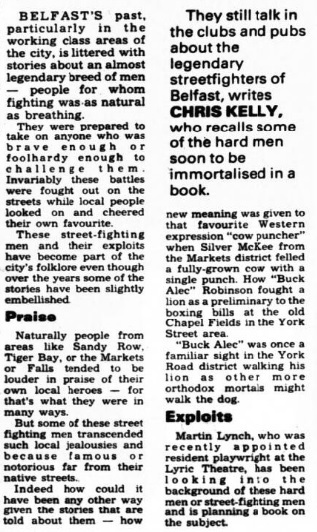 Whilst the men mentioned in this thread were undoubtedly very hard nuts, the mention of Chuvalo brings to light the fact that boxers are on a different level of 'hardness' altogether. Even the most modest boxer would wipe the floor with pretty much any streetfighter. Vastly superior technique, timing, composure etc. 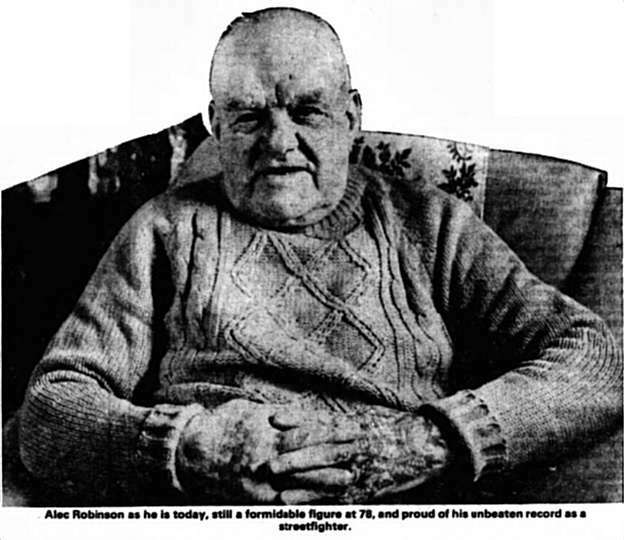 Lenny McLean was lauded as the 'Hardest Man in Britain' for years and was destroyed in a round by the likes of Johnny Waldron and Cliff Field. Agree Sparty. Not only that, if you look at some of the fights that took place between many of the “old pro boxers” you will see that a lot of fights were fought with men who were fighting out of their normal weight limits. Eg, it was common for a welter to be matched with a middleweight or even a light heavy, likewise a lightweight matched against a welter. In general there were only 8 weight divisions, unlike today. Just read through a lot of these posts in some detail and I'm intrigued [always have been] how we manage to make heroes and legends out of people whose 'careers' were at best dubious and often much, much worse. 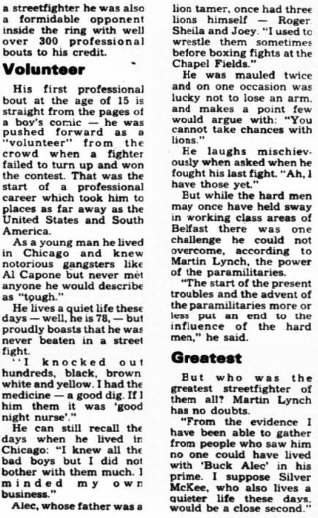 As Martin Lynch points out in this newspaper post, reputations as hard men transcended local jealousies, tribal loyalties and even past reputations; some of it became almost mythical. 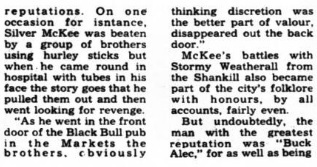 I remember that Silver McKee, Buck Alec and a few others whose names I have forgotten were the stuff of legend as far as my father and others were concerned and stories of fights between them assumed the status of Greek, Roman and Celtic legend. 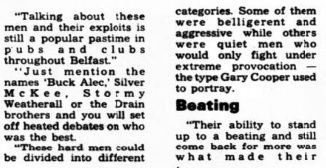 It was almost as if none of the faults they would have attributed to other people applied to these guys simply because they were 'hard men' - whatever the hell that meant. What circumstances brought an end to this era of 'hard men' - education? more even wages? less poverty in working class areas? the troubles and the rise of the paramilitaries with guns instead of fists? Who gives a damn anymore whether Buck Alec could beat Silver or who punched what cow or fought with what lion? Good riddance to all that crap and good riddance to making Robin Hood and Hercules out of brawlers, street-fighters and worse. Some time back a person who works in loyalist areas to try to raise educational standards said to me 'We are trying to make 'smart' the new 'hard'. Good on him and good luck to him in helping kids to educate themselves. Maybe one of them will sit down some day as a university professor, investigate and record this type of urban story and part urban myth for the romanticised and sanitised rubbish it was! I knew Stormy well. A very decent bloke on every account. He would have been happy enough had he been allowed to go about his normal business. Sadly there was always some idiot who fancied their chances and wanted to make a name for themselves and equally sadly they usually learned the hard way.